In the house in my head, aka my dream house– I imagine white canvas slipcovers on over-sized seating, a big stone fireplace, with white, beige, and purple accents, along with a great view of the ocean out a bank of french doors. The house I physically live in well – has blue upholstery, a brick fireplace I painted white, french doors, but they only look out to my backyard, and I do have white and purple accents, thanks to HomeGoods. After finishing this project – white canvas slipcovers, the distance between the house in my head and my real one is getting smaller one teeny-tiny step at a time. *Update: Not only did I accomplish my design dreams in this house, I also was able to design my dream room in my new Lake home. I have been hunting for ottomans for this room as it’s size and architectural details doesn’t allow for a lot of seating. Ottomans are great multi-tasking pieces – they are low profile so they visually don’t take up a lot of space. They can easily be moved around the room – in front of the fireplace, against the sofa for your feet, moved into a conversational grouping with the sofa and matching chair, or used as a table when a tray is laid on top. 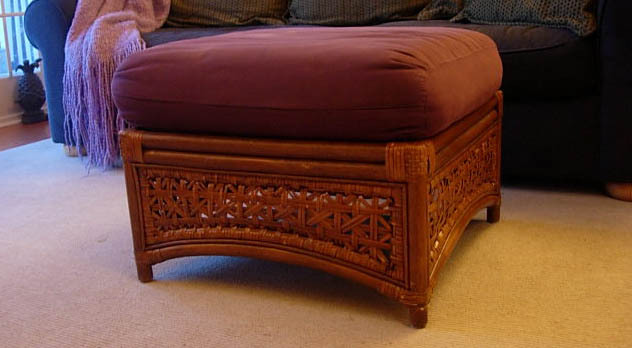 When I saw this ottoman I knew I could try to cover it in white canvas to get a smidgen closer to my vision. I bought two of them during a clearance sale at my local furniture store. My original plan was to just cover the purple cushion with fabric, gift-wrap style and secure the loose fabric underneath the cushion with safety pins. That worked fine, but I really wanted a pleated flounce and thought if I put my mind to it I could make a real honest to goodness slipcover. I thought- I can make pillows, I can do this, too. I found the fabric at a dollar a yard fabric center near my house. You have to search through racks and bins, but it is always worth my time because I always find something good. I didn’t use a pattern since the cover would be a basic box, no arms or curves, which would have been way beyond my skills. I also added piping. To save you a step you can buy pre-made piping by the yard at fabric stores in many different colors. I am thrilled with my effort, it is just a touch of my vision of having white over-sized seating, my imagination will have to do the rest, at least for now. Wash fabric first before constructing the cover to allow for shrinkage. 1. Measure the top and sides of the cushion and add 2-inches all around for seams. If you want a loose fitting cover add to your measurements. 2. Lay cushion on center of fabric and mark exact size of top of cushion. Add the depth of cushion and add 2″ extra for seam allowance. Cut fabric out. At each corner, angle cut as shown. 3. With fabric inside out, sew each seam. You will have created what looks like a box lid. 4. To create the pleated flounce, measure around the ottoman (mine was 87″). Double that measurement for pleats and add 1-” for seam allowance. 5. Using straight pins pleat the fabric along its length as shown above. 5. Pin the pleated flounce to the edge of the box, making sure right sides are together. If you are adding piping, pin the piping to the edge of the flounce first and then to the edge of the box. Sew along the edge leaving about 3/4″ seam. Pin and then sew the two ends together and trim excess fabric. 6. Press all the seams open, turn fabric right-side out. Place on ottoman. These have held up so well, but after 8 years of wear and tear I thought it was time to update them. You can see how I updated them here. love all the pics! that helps so much – nice job with the tutorial – really really usable. You did an outstanding job! Love your drawn out details! Thanks for sharing! This project is fantastic. I am including this in my Inspire My Saturday post today. Please feel free to stop by and check it out if you get a chance. Fabulous and a great tutorial, thanks for linking up! I really like it. I like the ottoman too. I am trying to get the courage to slip cover my sofa. I just (4 years ago) had it reupholstered in L.A…then we moved…they were late, etc….had to have it shipped to where I live now…and it is a mess…the fabric has not held up…hubby says…”you asked for it, you got it (he liked the old fabric-ICK!). S your ottoman turned out cute…I can do this!…I think. I love it! It looks fantastic! I’m sure it looks great in your house now as well as the house in your head:) Thanks so much for the link! This is soooo pretty, and I love the ruffled detail! Thanks for the tutorial and for linkin’ up to Frugalicious Friday! Thanks Ann for the link to fabulousfluffstuff. She is a really talented sewer. I love the monograms. Sandy- You got me thinking, now I am on a mission to find some more fabric. Cha Cha – You are so clever with words. Love your comment. Very nicely done and so pretty. Thanks for your comment at my life changing post. You are right, being miserable is not the way to live. Great job and great tutorial. Another blogger has the same vision you do and this is the link to her site. Both projects make me think of great summer linen dresses with great lines. Thanks for posting. Great job and thx for the beautifully drawn tutorial. Looking at your photo, my eyes are drawn to your pillows on the sofa, and it makes me think how great they would look in the same white fabric. What do you think? well doesn’t she look pretty in her new dress. I love how full her skirt is, it shows off her curves and plays up her shape–hahahaha. I love it, but I knew I would, you never disappoint.